1. Do you use one or more of: Facebook, Twitter, Pinterest, Google+, Instagram, Flickr, LinkedIn, or Foursquare? If you don't use at least one of those, you may want to skip the rest of this; however, if you use one or more (especially if more), then you may want to read on. 2. Do you play any casual, browser-based/mobile app games? 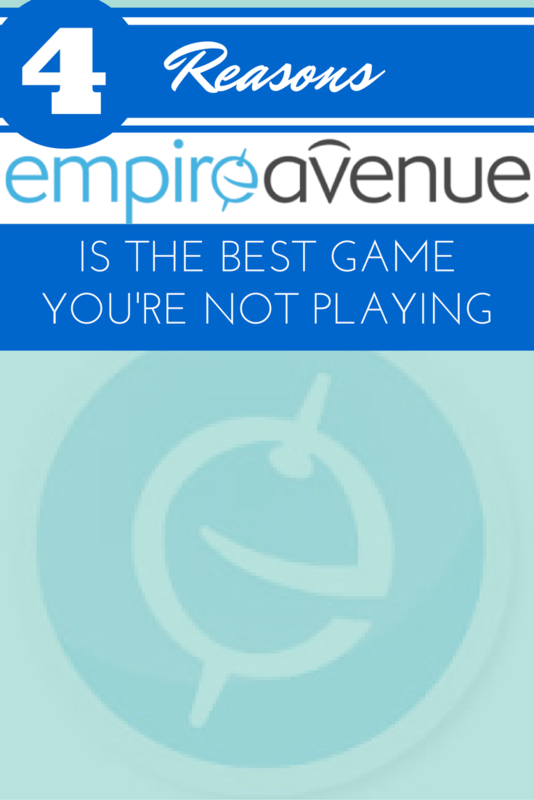 If you do, then Empire Avenue (EAV) may well be the best game you're not playing. I've talked about EAV before, you can refer back to those posts and watch the video below, to get the gist of how it plays like a virtual stock market in social media users. This time around, I want to focus on the main reasons why its worth playing for casual social media users and bloggers. Especially its (largely untapped) potential for fandom and politically engaged social media users as a platform for supporting their interests ... while playing a game. EAV connects you with social media leaders, professionals, bloggers, and business people. Tweets, blog posts, pictures, or pins, whatever it is you do, wherever online you do it, you can use Missions to promote your message so you can get quick and meaningful exposure for interests and a potentially large audience with minimal time and effort. The content that you're putting out there, well, there are other folks across a number of different fields and areas of interest are doing the same. You can join or create communities specifically to explore whatever interests you with players with similar interests. 4. It's ripe for a geek takeover! There have been sci-fi/fantasy geeks on it all along -- stop by the Doctor Who community on EAV and say, "Hi!" -- but there aren't a lot of geeks playing ... yet. If more of us play and support one another, the potential for enhancing the content discovery aspect of the game and growing the audience for your own works increases. EAV has been around for a few years, but it's just starting to take off. Now is great time to get in and get established while the game is growing. If you decide to give it a try, I can help you get off to a good start. I'll introduce you to experienced players with similar interests, help you avoid newbie mistakes, and will do what I can to help your Empire grow. That's it. That's my spiel. Check it out!